Manufacturer Cin Chili & Co.
Move over A-1...there's a new steak sauce in town! Make it sizzle with a drizzle of Cin Chili's Triple C Steak Sauce. Pour it on your favorite meats and side dishes. 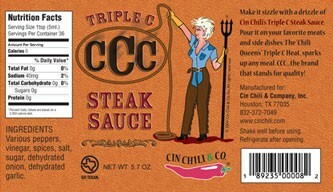 The "Chili Queen's" Triple C Heat, sparks up any meal. CCC...the brand that stands for quality! 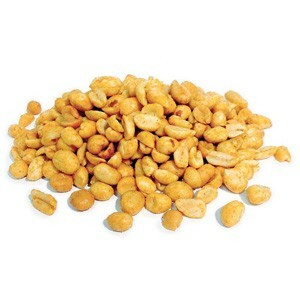 Ingredients: Various peppers, vinegar, spices, salt, sugar, dehydrated onion, dehydrated garlic. This sauce is awesome! I highly recommend it over any other steak sauce. I will be buying this regularly for sure! Advantages: Spices are just right!